Biofinity XR feature an extended range of powers from –20.00 to +15.00. They feature a high water content and oxygen permeability and are thus suitable for occasional extended wear. 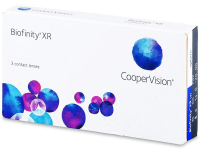 Biofinity XR are silicone hydrogel monthly lenses produced by CooperVision with the possibility of extended (overnight) wear. 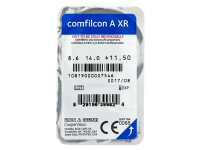 They are available in a wider range of powers for those with severe short and longsightedness. 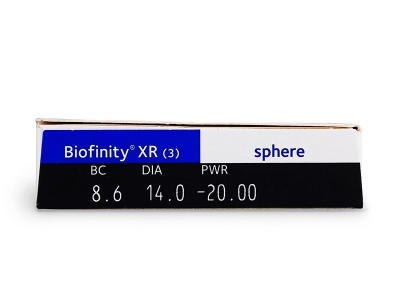 Biofinity XR contact lenses are designed for daily wear, but may be worn on an extended wear basis if approved by your eye-care specialist. The Comfilcon A lens material combines a high water content with excellent oxygen permeability, ensuring a balanced ration of moisture to oxygen. One basic rule of hydrogel lenses is the more water the lens contains, the more oxygen permeates through. In the case of silicone-hydrogel materials, the transmission of oxygen and metabolites is possible due to their free passage through microscopic channels in the lens. The aspheric front surface improves the optical properties of the lens and improves visual acuity in low-light conditions while also correcting lower levels of astigmatism and presbyopia. The lens has a rounded edge to enhance comfort and prevent eye irritation. The design of the rear surface of the lens is constructed by using several curves. Thanks to this, the pressure made by the lens is equally distributed over the whole surface of the eye. 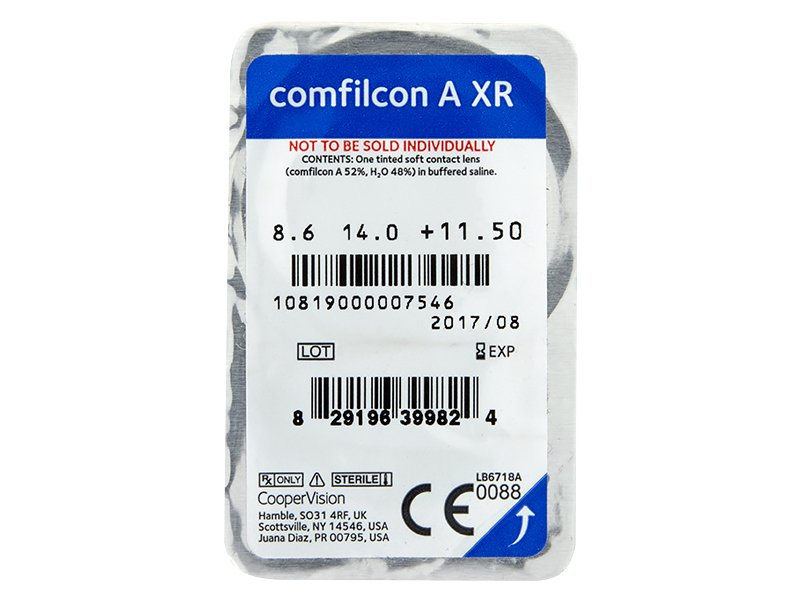 AQUAFORM Comfort Science™ technology uses a new silicone monomer, which provides more effective oxygen transmission through the lens. New technologies link the hydrophilic (water-binding) and silicone (water repellent) components in a way that creates a naturally moist material. The water content is equally balanced throughout the entire volume of the contact lens. The material of the contact lenses contains no ions (electrically charged particles), so the lenses are resistant to the accumulation of protein and lipid deposits. You get good comfort from these every day. Really are a lens that you can put in and forget about. Hello, what is the difference in biofinity vs biofinity xr? Dear Raj, the Biofinity XR power range is wider, accommodating prescriptions from –20.0 to +15.00. The standard Biofinity range is between –12.0 and +8.0. Hi, Rob, You should simply be able to select your strength via the drop-down menu. If you have any questions, please contact our customer support.